World champion Rebecca Gallantree has said she considered retiring after the 2012 Olympics in London. 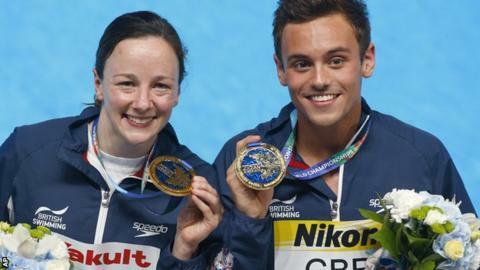 The 30-year-old, who came seventh in the 3m synchro event in London, won gold in the mixed team event alongside Tom Daley at the World Aquatics Championships in Kazan on Wednesday. "I was very close to retiring after London, but I decided I had a bit more to give the sport," she told BBC Essex. "It's turned out to be the best decision I've ever made." Gallantree became the first female British diver to win a medal at world level, and also finished 10th in the 3m springboard final, earning Team GB an additional spot at next year's Olympics in Rio. "There's a lot of hard work to do to qualify for Rio," she said. "I'm going to work really hard to make sure I'm on form for the Olympic trials so I can use that spot I earned for Great Britain. "There's another opportunity in February, at the Olympic test event in Rio, for us to qualify for a spot in the synchronised event. That will be tough." British champion Galantree will be attending her third Olympics should she get to Rio, and the 2013 European bronze medallist believes Great Britain's diving team are in a good position. "We've just had our most successful World Championships ever," she said. "We are in a brilliant place. "I hope that people have watched us winning medals and been inspired to try diving or even to take up other sports."